The idea of INFINITY as some unimaginably large degree or amount is not quite accurate. (2) We may demonstrate this mathematically as follows. We note that the smaller the divisor, the larger is the quotient. When the divisor is very close to 0, the quotient can be imagined to be very, very large. But as long as it can be defined, it is not infinite. (3) Division tells us how many times a number can be taken out of another number. (4) Infinity cannot be defined. Anything defined, by definition, has limits. Considering INFINITY in terms of “some unimaginably large degree or amount” defines it no matter how subtly. This would not be an accurate consideration of infinity, which has no limits. You right about infinite that is the reason people dont get what is being spiritual, they must have some object or ides connected to but most of the time that subject or object is the infinite than the loss occures when the object is gone no more. Oh-oh-oh I have died I am no more! Hi Vin!! Hi Elizabeth! Spirituality is quite mathematical in spirit. People have tough time with mathematics, and most seem to have no idea what spirituality really is. A Being is an object like an electron. A Being is not infinite. Would you characterize the physical universe as finite or infinite? Infinity itself seems to be relative as George Cantor showed. The physical universe may be looked upon as infinite, but it is finite relative to the Unknowable.. If we wanted to consider the physical universe as a bubble which contained everything, we would be creating a finite set? If we wanted to view the physical universe as a growing set, how would we characterize it? I suppose the body is finite even as it grows. Receiving injections of MEST, the body grows. As the finite universe grows, does it receive injections? I have no idea. Is there some inconsistency that you are wrestling with? I was trying to separate what is universe from what is not, etc.,. I have studied that the 1. universe is growing. 2. this growth is accelerating. 3. It seems consistent that the universe can be considered mathematically as a set, a bubble if you will which contains everything. This is a finite concept. 4. It seems consistent to me that infinite is not only a consideration, but also that infinite things are contained within the finite universe. This is counter-intuitive to usual thought, but I see this as consistent. 5. Then I think I’ve created a paradox for myself if the universe is expanding without limit which would be defined as infinite. 6. So to resolve this inconsistency I am leaning toward thinking that the universe is infinite and that within it are infinite things. 7. For Finite to be consistent, it must be conceived as a piece of what exists. This fractional idea seems to be manufactured by math and maybe existing only conceptually in math. Things are actually what they are. They are not a piece of a whole in reality. A box of nails is just that and when you remove a nail, it is a nail and not 1/100 box of nails, see? So, though useful, fractions are judgemental as we cannot obnose the box of nails from the one nail. I see the universe in this way if I want to look without judgement. 8. Nothing that we know of exists outside the bubble of the known universe. We perceive a little bit of the universe. We know of Radiation that we perceive with machines but not our natural senses until translated by machines. It seems reasonable to assume that there will be more than this. 9. So we consider the universe to be ballooning. What is creating this expansive pressure? Math would predict if this is true that an injection is occurring, would it not? In your first sentence you seem to be playing with the unknowable. In (3) you seem to have a good starting point. In (4), you are right that infinite may occur within finite limits. for example, there are infiniy of irrational numbers between the numbers 1 an2. Re (5), more of a paradox is how the universe came to be in the first place. Prior to the occurrence of the universe there were no dimensions. How did the very first dimension came to be? In (6), do you mean to say that the universe is finite? 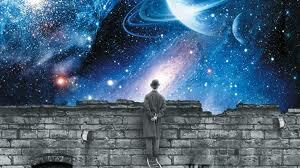 That is how I see the universe to be. It is finite. It is like a bubble floating in the great unknowable. (7) A fraction may be looked upon as a unit in its own right. For example, 1/12 of a foot makes the unit called an inch. Fraction occurs more as a result of comparison as in ratios. What you have written here is quite profound. (8) The universe is basically made of considerations. When we speculate about what is beyond the universe, we simply add more considerations to the universe, making it grow. I think that (8) above answers your (9). The universe seem to be made to grow by the speculation of what is beyond the universe.